My papa was born June 19, 1910. Several years ago, I dabbled in genealogy research. I bought the Family Tree Maker that came with records on lots of CDs. I would pick up the project and put it down in spurts of interest. In the Summer of 1998, I began attending Inquiry sessions to learn more about the Catholic Church. My mom knew of my interest and it reminded her of some things about her father — my papa. I don’t know if I’d heard the story before but it seemed I had not. She said that her daddy and granny had moved to Terre Haute, Indiana after the accidental death of his father. Dates confirm his death April 30, 1929. All mom recalled is that they worked in a hospital and boarded at a convent. Perhaps he had studied the church Catechism. That Summer, I did my best to research for more information — even emailing a convent to find leads. I became fascinated with the stories of women religious communities and was often sidetracked in my research. Mom gave me a few items that were papas — an ebony crucifix that is about the size that would be worn on habit rosary — a medal of Our Lady of Perpetual Help that I wear to this day — two prayer pamphlets 1) “A Daily Visit to The Blessed Sacrament” IMPRIMATUR, William Turner, Bishop of Buffalo, and 2) “A Remembrance of Our Lady of the Sacred Heart” — and then there is papa’s journal. Papa liked to write and he wrote two poems of Catholic influence dated 1929 and 1930. I have these old photos taken in front of a statue of St. Therese of Lisieux. In faded pencil are written “Mother St. Anthony’s Hospital Terre Haute” on the back of one photo. The other photo is written April 1930 on the back. I was very prayerful as I discerned entering the Catachumenate — to formalize my intentions. One night I had a dream. I was sitting on a church pew — the front row — a deceased uncle was sitting on my left and I was looking down at the floor — a prayerful posture. I was gazing down at shoes as I realized someone was standing in front of me. I raised my eyes up to look into the smiling face and laughing eyes of my papa. I felt assurance. I put aside my genealogy ventures for quite some time. The research spurt came more recently as Ancestry[dot]com brought research to a web based environment. I played around with free access information. I found census records for the various places my papa lived with his parents and sister. In March 2007, I found the gem I’d been looking for — the 1930 Census taken of St. Anthony’s Hospital in Terre Haute, Indiana. I scanned the names and there was my papa listed as a “painter” and my great-grandmother listed as a Widow and servant. Papa was 19 and learned the painters trade while there–it was his lifelong profession. My jaw dropped in amazement at the long list of Sisters names — the nuns — close to thirty names. Many had German parents as I learned they were founded originally in Germany. With this information, I learned that the hospital was founded by the Sisters of St. Francis — Franciscan nuns. St. Anthony’s Hospital was a teaching hospital for nurses. This order of Sisters founded several hospitals. Even tonight as I write this, I’ve discovered an online book from the Vigo County library that tells of the hospital. As these discoveries unfold, it is interesting that I find myself Catholic and a Franciscan. I have no idea what sent my great-grandmother and my papa to Terre Haute — to those jobs at the Catholic hospital. I don’t know how far my grandfather got with his study of the Catechism. The hospital is no longer named St. Anthony’s and is Terre Haute Regional Hospital. Not only is it my papa’s birthday, it is the Solemnity of the Most Sacred Heart of Jesus. It is also the opening of the Year for Priests. A few weeks ago, I looked ahead at our Elijah Cup schedule and saw that the May 3rd 9:00 Mass was still open. Perfect. Nothing better than bringing the Elijah Cup home on the Sunday designated as the World Day of Prayer for Vocations. In the many years my parish has participated in the Elijah Cup, this is only the second time I have signed up to bring it home. I’ve never needed to have it in order to remember to pray for vocations. We are asked to place it in a place of honor in our home. I did this upon returning home; however, when the tornado warning siren went off in my county, I snatched it and the prayer book up and raced to my basement. While taking cover, with the cup clutched close to me, I browsed through the pages of the prayer journal that accompanies the cup. I actually found my prayer dated – 2/11/01 – where I wrote, “I ask the Lord to guide and bless those of our youth who may be discerning a religious call in their life.” It is indicative of my ministry at the time — Life Teen Core Team member. It was very short while many of the entries are longer. I was not yet fully professed with the Secular Franciscans. Here and there I find entries with men named who have been ordained to the permanent diaconate or the son of a parishioner who was in the seminary — now fully ordained to the priesthood. In the last year, I expanded my church family via the Internet and methods of new media. I met Fr. Roderick Vonhogen,a priest in Amersfoort, The Netherlands, who has to bicycle between Masses at various parishes — there are not enough priests. In the last year, I witnessed a friend’s ordination to the Transitional Diaconate. My daily vocation prayer has become a familiar routine. I do pray in general for a increase in vocations to the priesthood, the diaconate, and to religious life. I also pray specifically for my friend, for the Franciscan family — most especially for the OFM Conventual Friars of the St. Anthony of Padua Province and for an increase in vocations to their way of life. I pray specifically for Fr. Roderick and for an increase in vocations to the priesthood in The Netherlands. Fr. Roderick reminds me of the severe shortage of priests in many parts of the world. He shares so well and so honestly in many of his Daily Breakfast podcasts the challenges he faces. Here is one of Fr. Roderick’s episodes with a lengthy opening segment on vocations that I highly recommend. Daily Breakfast 612 – Vocations Click on arrow to play the MP3 file. For Extra Credit: Fr. Roderick played some voice feedback I sent him in March about the Elijah Cup. I was responding to his episode on Vocations from the above link. Daily Breakfast 632 – Alien Potatoes click the arrow button to play the MP3 file. My feedback is near the beginning but the entire programs are usually around 27 minutes. You will enjoy the entire episode. Sometimes I’m in the chat room when he is live broadcasting the recording of his programs. I was in the chat room during this episode. God speaks loudest in the tranquility of nature. Tomorrow morning, I will be speaking to the youth about how to “Walk His Way.” Today, I’m asking God to show me His Way. It’s my quiet time as I walk alone around the lake and into the woods of the nature trail. Contemplating the road before me, I am looking for God’s signposts. Passing by a bush, I notice one leaf is caught in the wind. It flutters with such frenzy. How oddly the one leaf stands out. “Here, look at me!” it seems to be shouting. I pause to watch for a moment, as the wind seems to only disturb this one leaf. Still bemused, I walk on. I can no longer hear the laughs and screams of children at the beach. I hear only the birds, frogs, crickets, and the sound of my feet. Coming to a bridge over a running stream, I sit down on the bridge. Staring into the water below, I think about my life and the decision I am making to deepen my relationship with the Catholic Church. The sound of the rushing water over rocks is the sound of the Living Water and Eternal Spring of Jesus Christ. I am a rock in that spring. I feel the refreshing water flowing over my troubled spirit. I pray to God for guidance to be in His Will in my decision to step into fellowship with the Catholic Church. I sit on the bridge for what seems to be an eternity. I am meditating on the nature God created and bringing my mind to a quiet place. With a calmed spirit, I stand and continue to walk. The path I take leads me through the woods, across a moss covered bridge, and to a stone bench. I sit on the bench and look upward. I see slivers of blue sky above the trees. I look for God above the treetops and cry. “Jesus, let my prayers touch the hem of Your garment.” [Luke 9:40-48] Tears flow as water in the stream. I am quiet and listening. I walk in peace to begin my journey to Initiation in the Catholic Church. So there it is in my photo, my little workspace shrine. In this workspace, we have short walls and I wanted to keep it minimalist. I’m mostly free of clutter. These are the items I don’t compromise. It is my little corner of faith and fun. I don’t really get questions about my St. Francis statue. But, a question about my beach photo will result in the telling of part of my faith journey. If you read my post on Sacred Heart, this part of my faith journey happened the same summer. I was 24 and the company I worked for was moving from downtown Atlanta. The office relocated to Gwinnett County. I had grown accustomed to riding Marta from my home in South Fulton — parking my car at the station and avoiding the drive into town. At the time, I was a complete freeway wimp. After finding out the location of the new office, I picked a Saturday and decided to get up early and give a trial run. We were still about two or three months away from the move. By the time I arrived, I was in tears. There is no way I can make this commute every day. Some time passed and I saw the blueprints of the new office. I saw my name written in the space of my new cubicle. The company was reorganizing and we received “offers” to remain with the company in our current capacity. I signed the offer that I accepted my “new” job. Summer arrived and we dealt with the sudden death of an executive. Things were on track to move in August. I took vacation with my family in July. My parents, sister, and another couple, friends of my parents, rented a condo in Panama City Beach, FL. Near the end of the week, I decided to take a walk on the beach alone. The move at work was very heavy on my heart. I was dreading the end of vacation and return to work. Did I really want the hassle of that commute for a job that wasn’t offering advancement? I was hired two weeks out of High School when I was 17. I was always the baby of the office. I was then 24 and approaching 7 years on the job. I walked and walked, the whole while my mind was racing. I teared up. Silently, I mentally prayed to God for guidance. That is when it happened — God spoke. As I was quietly praying and seeking God, I began to hear words in my mind that were not mine. God said, “Go back and turn in your resignation. I will take care of you. I always have.” The weight was lifted from my heart and I relaxed. I no longer had a decision to make. I had a command to obey. I raised my camera to the sky and turned to the sun and took a photo of the shore line. I returned to work on Monday and typed out my resignation letter. I set my last day for the last day that our office was downtown. I’m not a spontaneous person nor a risk taker. My resignation took many by surprise. The last thing I did was shut down the telephone service in the Bellsouth equipment room and transfer all the calls to the new office in Gwinnett. I got on the Marta train home and looked to my future. I didn’t have long to wait because I’d lined up a two week assignment helping out a friend. I also signed up with a contract employment company and requested airline placement. The airport was on my side of town and the true opposite of the commute I’d just avoided. I was placed in September and by December accepted their offer of full time employment. I framed my photo from the beach and put it on my desk. That photo has traveled with me to every new desk and new job in the company. It is a source of solace when I’m frustrated and feel like quiting. Once, I was up all night praying over a job bid. God again gave me the courage to act on it. That career change landed me on a team with an evangelical Catholic. The little koala bear that clings to my photo was a gift from the friend who became my RCIA sponsor. 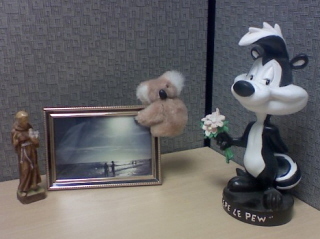 Pepe Le Pew lives on my desk too. He’s my favorite Looney Toons character, or, perhaps it is really Penelope that humors me. Penelope the cat — the mistaken object of Pepe’s affection. Perhaps I’ve run from one or two smelly suitors of my own. Maybe I have a convent spirit in a cubicle world.